Sagamore is an Eamon adventure written by Joey Czarnik. Sagamore is an example of an Eamon "orphaned" by its author. In his review, Tom Zuchowski relates that Czarnik sent the adventure to the Eamon Adventurer's Guild in 1993 and, after correspondence devoted to editing and debugging the adventure tapered off, Zuchowski put in the necessary fixes and released it in a relatively unfinished state in 1996. The narrative of Sagamore presented in the pregame sequence is limited to the instructions "Fight your way through Sagamore's Castle!" 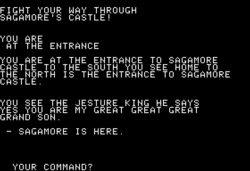 The remainder of the narrative—such as who Sagamore is and why the adventurer is fighting his or her way through his castle—is conveyed to the player through the descriptions of the monsters during play. The eponymous King Sagamore is revealed to be the adventurer's great-great-grandfather (and Sagamore Castle hence the player's ancestral home according to the Eamon Deluxe conversion), a fact which wins the adventurer the aid of Sagamore's skeletal knights. The antagonist of the adventure is the "renegade lord" Galen Dracos, who has aspirations of conquering all of the planet Eamon by unleashing a "monster invasion" of demons, dragons, and vampires upon Sagamore Castle. Tom Zuchowski's review was negative, giving it a playability rating of 2 out of 10. The adventure's brevity, spelling and grammar mistakes, and uneven value of the adventurer's haul relative to the length of the adventure—e.g., a bag of 20,000 and a chest bearing 30,000 gold pieces, respectively—were lamented in the review. Castle Sagamore is described as lying north of the Main Hall. The term "sagamore" is an anglicanized form of a host of Algonquian terms used for the title of chief of an Algonquian tribe. It is also possible that the author of this adventure intended a reference to Sir Sagramore, one of King Arthur's knights, often depicted as being Mourish or Hungarian in origin, also frequently said to be heir to a distant kingdom. The adventure features a weapon called "Storm Bringer," described as "the best sword ever forged in the universe" and constructed from an alloy of the metals "Triforcium" and "Exactium."